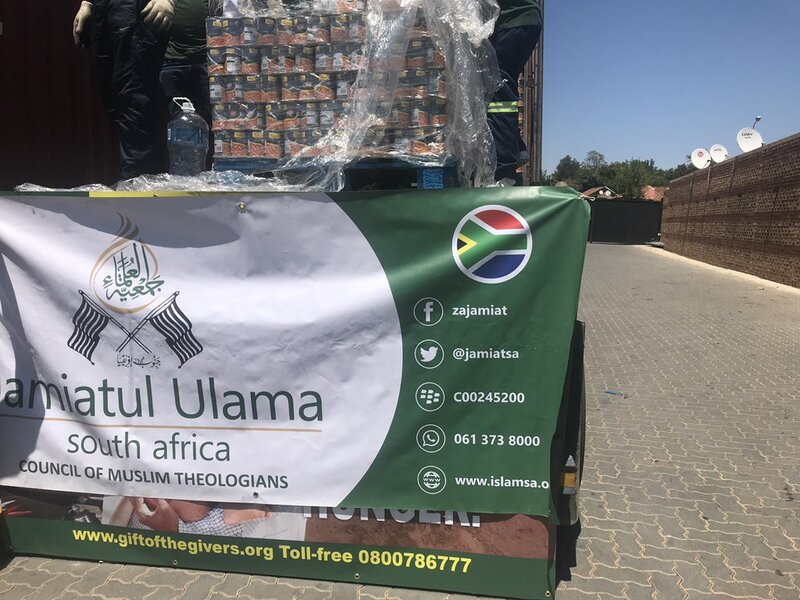 The Jamiatul Ulama South Africa in collaboration with the Gift of the Givers, today (13 Dec 2018) saw off the dispatch of over 51 metric tonnes of canned food to Yemen. This initiative is aimed at providing relief to the war-torn country, whose thousands of children are suffering from malnutrition, amidst drought, famine and disease. The Yemen war, now running for over three years, has pitted regional powers, flexing their military might, by supporting opposite sides of the conflict, in a typical geopolitical power-play. Meanwhile, the Jamiatul Ulama South Africa expresses support for the peace talks underway at Rimbo, in Sweden, and welcomes the news of a deal of a ceasefire around the port of Hodeidah. Cessation of hostilities and security around the Red Sea port, will not only prove to be a confidence-building measure, but also, crucial for the humanitarian relief effort, easing the logistical operations, for the delivery of relief to the people of Yemen. Experience from conflict zones shows that it is sometimes easier to wage a war than keep a peace. We pray that the small but significant steps made by the warring parties in Yemeni, through the UN-sponsored direct talks in Sweden, will in the short-run be consolidated, and eventually culminate into nation-wide peace, conciliation and resettlement. As we have stated in the past, only a political solution will provide a lasting settlement for Yemen, as none of those the belligerent parties can claim a military victory, from the current stalemate that only exacerbates loss of lives, suffering of the most vulnerable and deepening tension. At the brief ceremony for the send-off of the food consignment to Yemen held today at the Bramley-situated, Gift of the Givers’ operations centre in Johannesburg, Moulana Ebrahim I Bham, the secretary general of the Jamiatul Ulama South Africa, expressed gratitude towards all those who have generously contributed towards the relief effort. He prayed for the blessings of the contributions of all those who have made this possible. The Jamiatul Ulama South Africa continues to appeal to all people of goodwill to continue supporting our relief work in Yemen. Currently, we are raising funds for the supply of water. Since May 2018, two water tankers provide clean drinking water, daily, to displaced and needy families in the cities of Taiz and San’aa. To date, more than 2 million litres of water have been distributed in war-stricken Yemen.